Description: Bill Burke's knives are as high performance as a hunter can get. 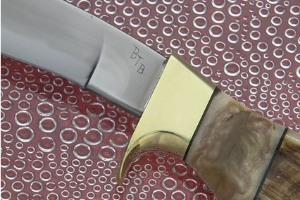 Each knife is pre-tested for edge flex and cutting ability before assembly. The heat treat follows the formulas developed by Ed Fowler, Bill's teacher, and has been proven to create some of the sharpest and most long lasting edges found anywhere. 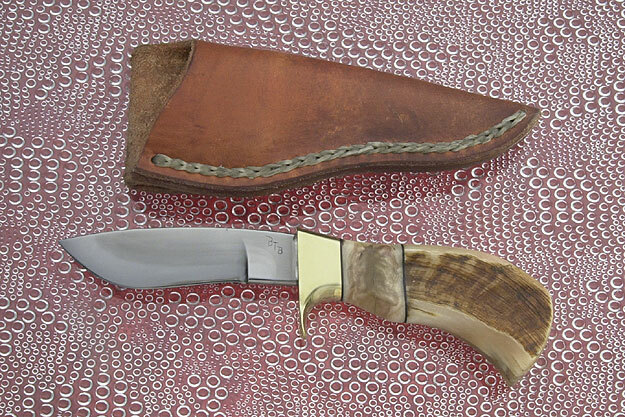 The sheep horn handle fits comfortably into the hand. When wet, sheep horn does not become slippery, and it is amazingly durable. 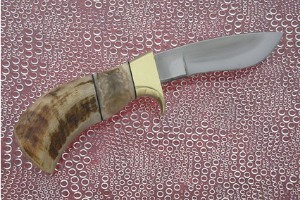 The spacer is created by taking two sheep horn end cuts and aligning them outward, producing a very pleasing effect. Excellent fit and finish throughout.